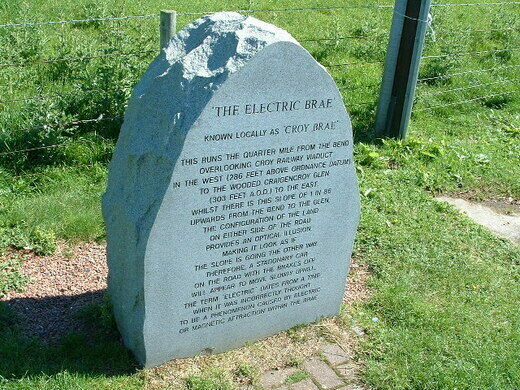 “The ELECTRIC BRAE”, known locally as ‘CROY BRAE’. This runs the quarter mile from the bend overlooking Croy railway viaduct in the west (286 feet Above Ordnance Datum) to the wooded Craigencroy Glen (303 feet A.O.D.) to the east. 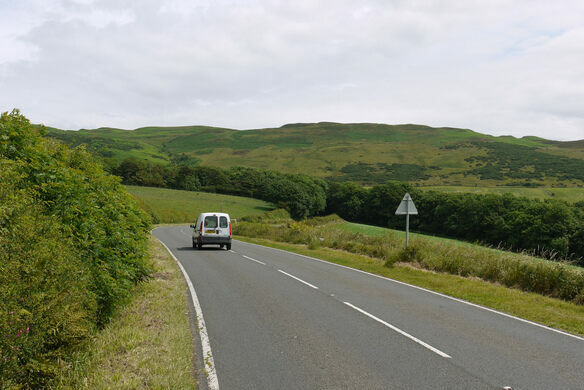 Whilst there is this slope of 1 in 86 upwards from the bend to the Glen, the configuration of the land on either side of the road provides an optical illusion making it look as if the slope is going the other way. Therefore, a stationary car on the road with the brakes off will appear to move slowly uphill. Known as a “gravity hill” it is actually a type natural optical illusion. The curve of the vergeside of the cliff road gives the impression of the elevation but it is opposite to what actually is. 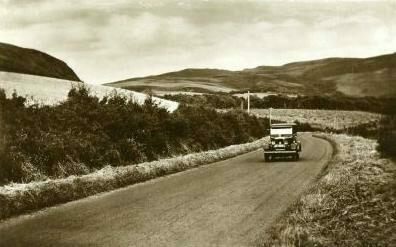 The road is one of the more famous gravity hills, and during WWII General Eisenhower would bring guests to marvel at it. Today, locals still have to beware of people stopped in the road amazed at their cars seemingly freewheeling uphill. Others will stop and put a ball in the middle of the road and watch it roll uphill. It is on the A719 between Croy Shore and Dunure village, South Ayrshire and is well worth a visit if you are in the area. Forgotten jail cells beneath this Scottish town hall are now used for delightfully artful storage.